Gordon Gregory watches Professor Jenny May present the conference recommendations from his home office. Delegates at the 15th National Rural Health Conference put forward more than 200 recommendations, with priorities including Aboriginal and Torres Strait Islander self-determination, planetary health and action to address the wider determinants of health. As we head towards the 2019 federal election campaign, longstanding rural health advocate and strategist Gordon Gregory offers some timely advice on how to turn these recommendations into advice that politicians can act on. 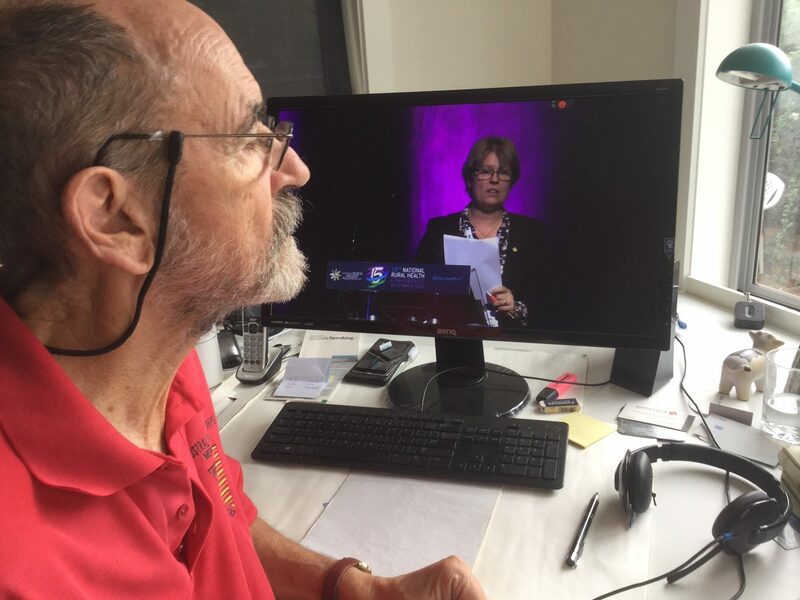 Gregory followed the #ruralhealthconf discussions via the live streaming service and also contributed to the discussions via Twitter. Melissa Sweet covered the conference for the Croakey Conference News Service: you can read all the #ruralhealthconf stories here. The National Rural Health Alliance (NRHA) has just finished running the 15th National Rural Health Conference. Conference delegates produced a large set of recommendations outlining what they saw as the priorities for action. Far too many were produced for all of them to be promoted to political parties in the lead-up to the federal election. Given the special opportunity for advocacy that exists in an election campaign, which ones should be pushed and why? An election campaign provides a special opportunity for advocates to get their particular issue onto the political agenda. This is because in order to win public support at the ballot box, political parties big and small engage in the process of formally and openly listing their intentions for the future in their election platforms. Success for a lobby group means having one or more of those parties commit to do something about the issue with which the lobby group is concerned. There are as many lobby groups as there are special interests, each of them trying to influence public opinion and policy. They use a variety of methods, including personal interaction with politicians, media campaigns, publicity stunts, polls, research and policy briefings. Lobby groups come in all shapes and sizes, with some of them existing only for the purpose of advocacy, while others have broader reasons for existence but take the opportunity now and then to advocate by outlining their concerns and seeking action from governments. Rural examples of these two types of advocacy groups are the Isolated Children’s Parents’ Association (ICPA) and the Country Women’s Association of Australia (CWAA). Both of these organisations are members of the National Rural Health Alliance (NRHA). The ICPA had its beginning in Bourke in April 1971 during a time of drought when parents were concerned with paying for the education of their children, many of whom had to be in costly boarding schools. The organisation has one aim and purpose: to advocate for the continued provision, at a level which is maintained in real terms, of the Assistance for Isolated Children Scheme. The Scheme provides a group of payments for parents and carers of children who can’t go to a local government school “because of geographical isolation, disability or special needs”. People join the ICPA to support this singular cause, with any other benefits from membership, such as a sense of community and new friendships, being incidental. The CWAA, on the other hand, is the peak national body bringing together and representing all of the separate local branches of the CWA, most of whose members join for social, educational, volunteer and neighbourly activity, not for political advocacy. The CWAA (which, incidentally is proud never to have had any government support for running the organisation), has what might be called incidental capacity for lobbying or advocacy because of the number of its members, where they live and what they experience and know. The breadth of an interest group’s advocacy is determined by its membership. Whereas the ICPA has a focus on one specific government program, a broad church like the NRHA has to be concerned with any matter that impinges on the health and wellbeing of people in rural and regional areas. It is quite common for people new to the NRHA to regard the breadth of its concerns as a weakness, summed up in the apparent sin of trying to be ‘all things to all people’. However, given that its membership includes around 40 national organisations spanning almost every health profession, as well as rural health consumer groups, Indigenous organisations, university students and researchers, the NRHA is duty bound to maintain an interest in the wide range of issues which is the sum of the concerns of its member bodies. People at the 15th National Rural Health Conference, aided by recommendations committee chair Professor Jenny May and the online system available to them, produced a large set of recommendations outlining what they saw as the priorities for action. Some prioritisation was done during the conference itself but essentially the set of proposals was additive. People at the conference from the ICPA would have been mainly concerned with distance education and the AIC; the general practitioners with the Rural Generalist Pathway; and members of Services for Australian Rural and Remote Allied Health (SARRAH) with allied health issues. The next step for the NRHA and other advocates is to seek the agreement of their members to adapt, if necessary, and adopt a smaller number of recommendations which then become the subject of advocacy. One of the simplest ways of selecting recommendations from the full conference set is to make judgements about which of them are tangible and detailed enough to become requests for programs. Put another way: which of the recommendations is little more than a motherhood statement and which can be converted to a new policy proposal for funding in the 2020-21 Federal Budget? A recommendation for the government “to commit to engaging in a process of truth-telling and agreement-making to eradicate discrimination, racism and improve health and wellbeing” can be met with the response that “if elected, the XYX Party will “engage in a process of truth-telling etc etc”. In such a scenario nothing needs to be actually done by the political party that wins government. A vague request for a particular principle or approach to be adopted can be met with a vague and untestable commitment. Contrast this with the announcement of 30 March 2019 about mental health support to be provided in nine drought-affected communities in four States through a Trusted Advocates Network Trial. Conference recommendations that are not as yet framed as new policy proposals include those relating to the importance of epigenetics in health; the application of a rural-proofing lens to all government policies; providing safe workplaces; investing in wellness programs for the rural workforce; and enabling activities that encourage the development of partnerships between all service providers including public, private and not for profit organisations. None of these ideas is unimportant but in their present form they do not provide a government with the way forward. Conference recommendation 1: We call for urgent commitment of funding to expand Aboriginal community controlled comprehensive primary health care services to not only diagnose and treat health issues, but to work in partnership with other sectors to tackle underlying determinants of health such as housing, education and employment. New Policy Proposal 1: The Federal Government should fund locally-controlled community health services in 20 small towns, based on the models provided by Aboriginal community controlled health services and Multipurpose Services (MPS), to provide primary care (diagnosis, treatment, management) and to work in partnership with other sectors to tackle underlying determinants of health such as housing, education and employment. Conference recommendation 2: A whole of government approach to rural poverty. This includes taxation and welfare reform such as increasing the Newstart allowance and stable housing. New Policy Proposal 2 (from ACOSS’s campaign): We call on the Government to raise the single rate of Newstart, Youth Allowance and related payments. Newstart has not increased in real terms in 25 years, but the cost of essentials has drastically increased. Over 800,000 people, including parents, carers, people with disability, other people locked out of paid work and students are struggling daily to afford basic essentials like a roof over their head and food on their table. There are 3 million people living in poverty in Australia, including over 730,000 children. Conference recommendation 3: Require research funding provided through the Medical Research Future Fund Missions, already covering areas such as cancer, genomics, to include research within and upon rural and remote health commensurate with the burden of rural and remote disease and disability. With MRFF Mission commitments of $1.3 billion to date, and given 28 percent of the population lives in rural and remote Australia, on a purely population basis this would amount to an existing commitment of $364 million – without taking into account the higher disease burden. New Policy Proposal 3: Reflecting the one third of the national population that is rural/remote and their higher disease burden, the Government should require the Medical Research Future Fund to allocate one third of its investments, by dollar value, to research activity that can demonstrate either general or specific relevance to the people of rural, regional and remote areas of Australia. Advocacy on rural and remote health might include entreaties to governments or researchers just to adopt new principles or approaches. But the patience of rural people is being tested and what is really needed to provide them with health equity are programs that work, and resources newly-committed or diverted from programs that don’t. 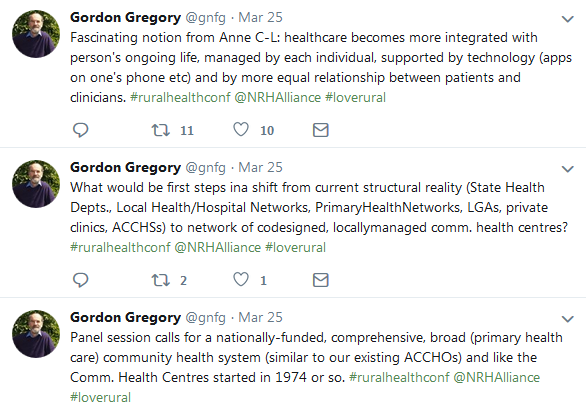 Gordon Gregory was at the helm of the National Rural Health Alliance for nearly 30 years, after working previously as a Ministerial advisor in a number of roles.